Music filled the 1960s. Festivals with thousands of people, like Woodstock, easily come to mind. Demonstrations filled the 1960s. Anti-war demonstrations, again with thousands of people easily come to mind. 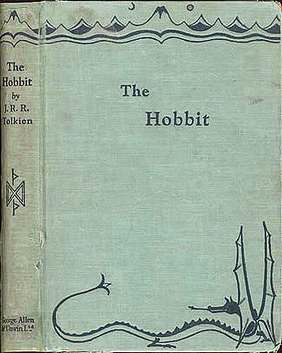 Fantasy literature filled the 1960s. Not mentioned as often nor demonstrated for (or against), but many authors come to mind. George Allen & Unwin first published J.R.R. Tolkien’s The Hobbit in 1937, but its fantasy fit right in with the emerging consciousness-raising of the imaginative mid-60s. That book and Tolkien’s Lord of the Rings sat beside Kerouac’s equally influential On the Road. With Antoine de Saint-Exupéry’s The Little Prince, another pre-60s publication (1943). And an even earlier (1923), Kahlil Gibran’s The Prophet. One of the “other” literary names associated with “those” 60s (although again beginning before that decade) is the wonderful Richard Brautigan. I’m not sure whether the The Pill Versus The Springhill Mining Disaster or Trout Fishing In America introduced me to him, but no matter. I fell in love with the style and off-center views both his poetry and prose gave me. who was ninety-three years old. every Monday and Thursday nights. He moved to San Francisco in 1956. His literary career was slow to succeed. He had written Trout Fishing In America in 1961, but it wasn’t published until 1967. 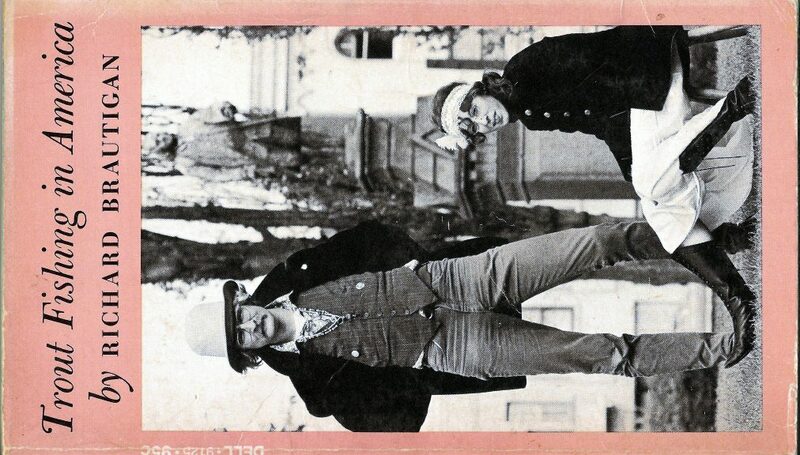 It was a huge success and made Brautigan a household name in households who held such outside the box views of worth. My household did. Of interesting historic note is that Apollo 17 astronaut Jack Schmitt named a crater explored in the Taurus-Littrow valley on the moon “Shorty”, after the character in the book. There is also a band that named itself after the book. Brautigan had grown up in poverty and when 20 was diagnosed with mental illness that shadowed his life. A friend discovered his decomposing body on October 25, 1984. The coroner’s estimate of death was September 16. Lawrence Wright wrote in Rolling Stone magazine of a gathering following Brautigan’s death. 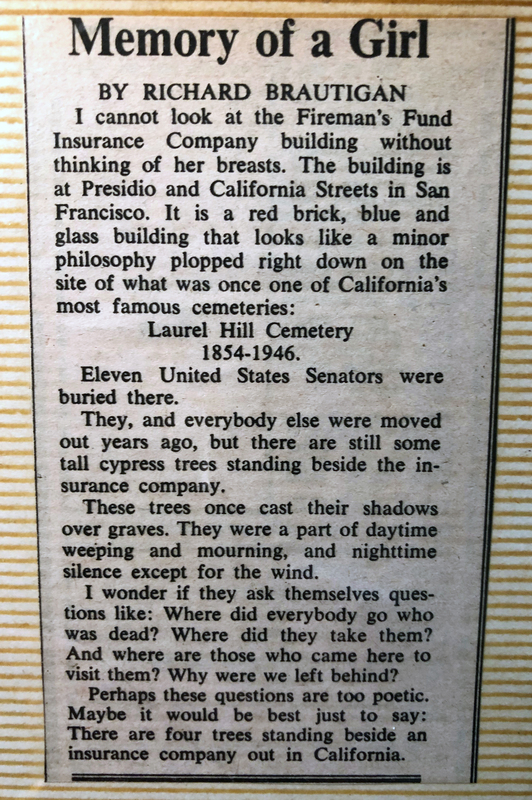 “…the friends of Richard Brautigan gathered at Enrico’s, Richard’s favorite San Francisco bar, to drink his spirit to rest. Some famous people were there, movie people, poets and writers, some old hippies from times gone by, one of Richard’s ex-wives, several girlfriends and a double handful of the alcoholic idealists whom Richard collected like spare change. The bartender wore an electric tie. They talked about why Richard died, and what killed him. Some blamed Ernest Hemingway, but most of them spoke of alcohol, women — and ghosts. He never learned to drive, never owned a car and by his own admission was inept at almost everything but writing. He published several collection of poems and novels.